Numerous applicants participated and took the examination conducted to give the admissions into the Undergraduate Engineering Programs present at NITs, IIITs, CFTIs, State government institutions, and some others for which candidates applied. After giving the exam, the appeared candidates must be searching for the answer keys for all sets which they got. It is also done to check their answers whether they filled the right one or not, so that they can estimate their results and rank. JEE mains official answer keys 2016 will be released by CBSE on April 18. The result date of declaration is April 27. In the meantime, the candidates can head below and check the unofficial answer keys and solutions with the links mentioned below. Joint Entrance Examination is conducted annually which lays the foundation of getting admissions in various reputed and ordinary B.Tech and B.E. institutions across the nation. Joint Seat Allocation Authority (JoSAA) conducts it for the admission in 18 IITs, ISM Dhanbad, 32 NITs, 18 IIITs and 19 Government Funded Technical Institutes. JEE Mains conduct in two parts / papers. The aspirants go for the first one or the both of them as per their wish. The paper 1 is conducted for B.Tech. and B.E. and paper 2 is made for B.Arch. and B. Planning programmes. Both contains multiple choice questions and are carried out in two modes – online (with computer) and offline (pen and paper). So, now scroll down and get the answer keys along with previous years cutoff marks. For 2016, it will be updated soon. It varies every year. JEE Mains was conducted by CBSE at various centres in 129 cities across the country and abroad. Approximately 12 lakh students appeared for it. Few questions were tricky but less challenging as compared to 2015 Physics paper. Some of the questions had two answers in single answer sections. Chemistry was a little bit tougher than the previous year. Q17 (Set F) had no answer in the choices given. Mathematics had some questions lengthy. Only the best two lakh students will qualify for the JEE Advanced to be conducted on May 13. They will eventually fight for the 10,000 seats in the IITs. CBSE has notified that the official answer keys will be released soon. It may be published on 18th April on its official website. Meanwhile, the candidates who had written the examination can check their answers with answers provided by some coaching institutions given below. It will be updated here at the earliest. So, stay tuned. The online exam is to take place on April 9 and 10. Stay tuned this website. 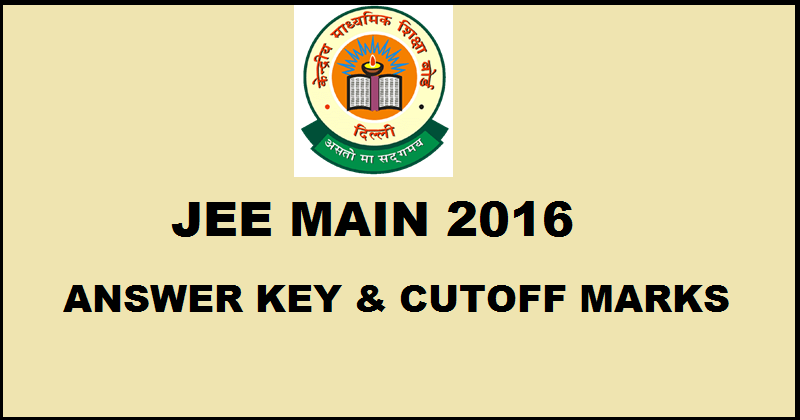 We will update JEE Mains 2016 Paper based answer key and online exam key here. Press CTRL+D to bookmark this page for easy navigation.